Cut up. Der sezierte Bildschirm der Worte (Joseph Melzer Verlag, Darmstadt 1969) with several entries by William S. Burroughs, Mary Beach, Harold Norse, Jeff Nuttall, Claude Pélieu, Brion Gysin, one by himself and one by Jürgen Ploog. ACID. Neue amerikanische Szene, more groundbreaking and with many more texts, also by Zappa etc, edited by the late Rolf Dieter Brinkmann with Ralf-Rainer Rygulla, published, after some kind of mini-revolution downstairs in the same building, also featured Weissner’s translation of Mary Beach, an extract from The Electric Banana; and Harry Mathews: Das Drehbuch. James Graham Ballard: Liebe + Napalm (Joseph Melzer Verlag, Darmstadt 1970). Re-released a couple of times, most recently as Liebe und Napalm: The Atrocity Exhibition (Milena Verlag, Vienna 2008), an association that led to Weissner’s German writing being published there ever since. William S. Burroughs: Die elektronische Revolution (expanded media editions, Göttingen 1972) The publisher in charge here was Udo Breger, friend of Weissner and together with Ploog editor of the avant-garde magazine UFO, which was for some time also co-edited by Jörg Fauser. Weissner, Ploog, and Fauser would continue, with Walter Hartmann, the less cutting-edge but more legendary lit-mag Gasolin 23. Charles Bukowski: Gedichte, die einer schrieb, bevor er im 8. Stockwerk aus dem Fenster sprang, poems (Maro Verlag Gersthofen 1974) This is where Fauser’s first book came out, followed by his very first one published by Breger’s expanded media editions. Charles Bukowski: Das ausbruchsichere Paradies. Stories vom verschütteten Leben, stories (1977). The first seven stories also published as Pittsburgh Phil & Co., the second lot as Ein Profi. Charles Bukowski: Western Avenue. Gedichte aus über 20 Jahren, poems (Zweitausendeins, Frankfurt/M. 1979), extracts have been re-published as Der größte Verlierer der Welt — Gedichte 1968-1972 (1979), Charles Bukowski: Diesseits und jenseits vom Mittelstreifen — Gedichte 1972-1977 (Hanser Verlag, München 1984), and Eintritt frei — Gedichte 1955-1968 (Hanser Verlag, München 1984). Compiled by Matthias Penzel and published by RealityStudio on 7 February 2012. 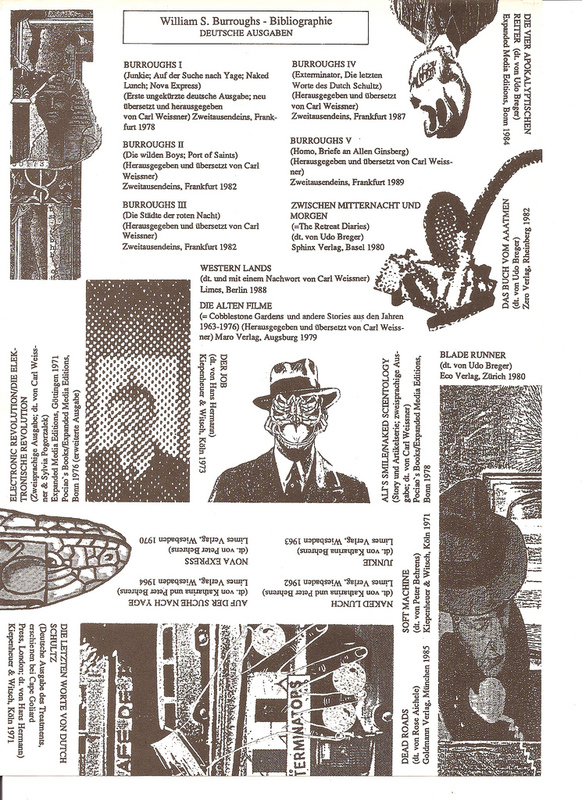 See also Penzel’s obituary of Weissner, “Transfers from a Different World.” The flyer “Burroughs in German” reprinted courtesy of Big Crux. Excellent compilation. I think there was also a stand-alone bilingual Ali’s Smile published by Expanded Media Editions, Göttingen 1973, featuring Carl’s translation. An impressive bibliography however you look at it. In fact, it’s little short of staggering. What’s more, it essentially stands as a catalogue of the most important countercultural and non-mainstream literature from the second half of the 20th century. It doesn’t get much cooler than that.